Just like poker, winning a Bidibot penny auction takes both luck and strategy. Since it can take some practice and learning to bid and win against more experienced bidders, Bidibot has incorporated some special features just for newbies. Auctions designated “Max Bids” and “Unlucky Bidders” and “No Bot” help level the playing field. Limits on number of auctions won now make it possible for even more poker and casino game players to buy credits for a fraction of their value. 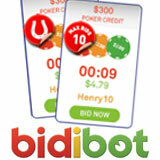 Bidibot is an online penny auction site that auctions credits at popular online poker and casino sites. $25, $30 and even $50 in credits usually sell for less than $5. With such incredible bargains to be had, competition can be fierce and many bidders have developed smart strategies. The site does have a “Strategy” section to help new bidders develop their own winning strategy while win limits and special auctions give them an opportunity to hone their bidding skills. Maxbid auctions, for example, are designed to restrict the number of bids placed per user, reducing the competition and giving new bidders a better chance of winning. The maximum number of bids allowed is illustrated on the Max Bids icon. And Unlucky Bidder auctions are open only to bidders that have never won a Bidibot auction. These auctions are a great place to start bidding against other newcomers. This week special auctions for Valentine's offer a wide range of consumer goods including televisions, iPods and cameras plus vouchers for Top Shop and spa breaks – and they’ll all likely sell for pennies on the dollar. Bidibot auctions credits for leading poker and casino sites including Poker Stars, UltimateBet, 888Poker, Absolute Poker, Titan Poker, Victory Poker, JackpotCity, JackpotJoy, Sportsbook.com, PartyBingo and DiceArena. Chilipoker, RPM and Slotland credits are also now available at the only online penny auction site for gamblers.